Offering you a complete choice of products which include evid c 8.2 speakers, electro voice evid c 10.1 speakers, electro voice evid c 12.2 speakers, evid pc 6.2 ceiling speaker, electro voice evid pc8.2 ceiling speaker and evid c4.2 speakers. Safety Agency Ratings UL 1480. Safe for use in air handling spaces per UL 2043.
tweeter. The EVID C8.2 loudspeaker utilizes a 2 nd order crossover network at 2.5 kHz, with a comprehensive protection circuit to protect the network, woofer, and tweeter drivers from excessive power levels. The C8.2 utilizes a transformer that offers a selection of 1.88 (70-V only), 3.75, 7.5, 15 or 30 watts delivered to the loudspeaker system using either 70-V or 100-V lines, or 8 ohm bypass. Selection is via a convenient switch on the front baffle. The perforated grille is finished in semi-gloss white powder-coated enamel. The baffle and bezel are constructed from UL 94V-0 rated ABS. The rear enclosure is constructed from zinc-plated, heavy gauge steel. The rear enclosure, with fiberglass damping material, provides an optimum internal volume for extended low-frequency performance. A rear cover, with provisions for a junction box fitting, provides access to a 4- pin terminal block that allows direct connection to the speaker with 12 gauge wire and provides pass through to additional speakers. The EVID C8.2D model features a 3-pin fire-safety rated input block. A tile bridge is included for safe suspension of the C8.2 ceiling systems in a drop ceiling that uses mineral wool, or other fiber-based ceiling tiles. The EVID line of ceiling speakers has been designed to work together as a complete system in a wide range of different ceiling constructions. They provide wide dispersion, high-efficiency, high-maximum output, ease of installation, and wide-range reproduction of music or voice. The EVID C8.2 loudspeaker system shall be comprised of a UL 94V-0 fire rated ABS baffle/bezel assembly, zinc plated steel rear enclosure, powder coated grille with safety tether, transformer with 8 ohm bypass, and 8-inch polypropylene low frequency transducer with coaxially-mounted waveguide coupled 1 inch titanium coated dome tweeter. The loudspeaker shall meet the following criteria: power rating shall be 75 watts of EIA RS-426A pink noise (6 dB crest factor). Frequency response, uniform from 50 Hz to 20 kHz. Pressure sensitivity, 91dB SPL at 1 meter (3.3 feet) on axis with one watt of pink noise (ref. 20μPa). Minimum impedance, 6.0 ohms. The loudspeaker shall be 255 mm (10.0 in.) deep and 270 mm (10.6 in.) in diameter. Weight shall be 5.0 kg. 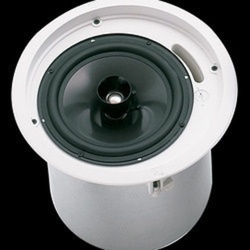 (11.0 lb) The coaxial ceiling loudspeaker shall be the Electro-Voice ® model EVID C8.2. installation, and wide-range reproduction of music. noise (6 dB crest factor). Frequency response, 45 Hz to 180 Hz. and 303 mm (11.9 in.) deep. Weight shall be 7.0 kg. (15.5 lb). 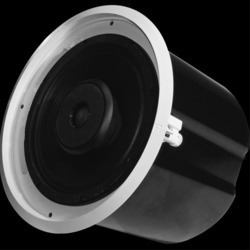 The subwoofer ceiling loudspeaker shall be the Electro-Voice ® model EVID C10.1. 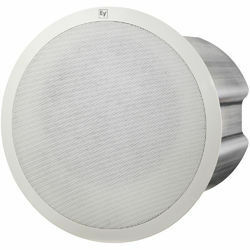 baffle and bezel are constructed from UL 94V-0 rated ABS. saturation compensation, and Evid 920-8B 12" coaxial transducer. shall be 100 watts of EIA RS-426A pink noise (6 dB crest factor). with up to 2.5 mm (12 AWG) wire and provides pass through to additional speakers. Two (2) adjustable metal tile bridges and metal “C” ring are included for safe suspension of the EVID PC6.2 ceiling systems in a drop ceiling that uses mineral wool, or other fiber-based ceiling tiles. The wide range of EVID ceiling speakers has been designed to work together as a complete system in a variety of different ceiling constructions. diameter. Weight shall be 7.0 kg (15.4 lb). 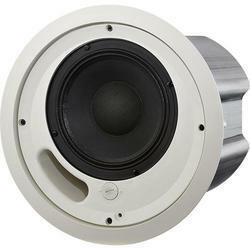 The coaxial ceiling speaker shall be the model EVID PC6.2 from Electro-Voice. shall be 100 watts of IEC 268-5 pink noise (6 dB crest factor). Frequency response, uniform from 40 Hz - 20 kHz. Pressure sensitivity, 88 dB SPL at 1 meter (3.3 feet) on axis with 1 watt of pink noise (ref. 20μPa). Minimum impedance, 6.0 ohms. The speaker shall be 324 mm (12.76 in) deep and 327 mm (12.87 in) in diameter. Weight shall be 8.0 kg (17.6 lb). The coaxial ceiling speaker shall be the model EVID PC8.2 from Electro-Voice. wide-range reproduction of music or voice. The EVID C4.2 loudspeaker system shall be comprised of a UL 94V-0 fi re rated ABS baffl e/bezel assembly, zinc plated steel rear enclosure, powder coated grille with safety tether, transformer with 8Ω bypass and 4-inch polypropylene low frequency transducer with coaxially-mounted wave guide loaded 3⁄4-inch titanium coated dome tweeter. The loudspeaker shall meet the following criteria: power rating shall be 50 watts of EIA RS-426A pink noise (6dB crest factor). Frequency response, uniform from 65Hz to 20Hz. Pressure sensitivity, 86dB SPL at 1meter (3.3 feet) on axis with one watt of pink noise (ref. 20μPA). Minimum impedance, 6.0Ω. The loudspeaker shall be 181mm (7.1in.) in diameter and 176mm (6.9in) deep. Weight shall be 2.7kg (6.0lb). The coaxial ceiling loudspeaker shall be the Electro-Voice model EVID C4.2.